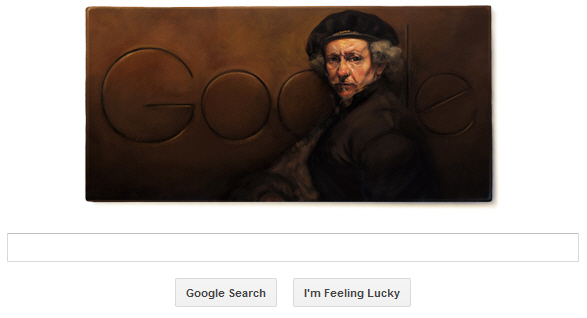 Google is celebrating Rembrandt van Rijn’s 407th birthday with a The self portrait or ‘Self-Portrait with Beret and Turned-Up Collar’ google doodle on its homepage. Rembrandt Harmenszoon van Rijn ( 15 July 1606 – 4 October 1669) was a Dutch painter and etcher.RembrandtHarmenszoon van Rijn was born on 15 July 1606 in Leiden,in the Dutch Republic, nowadays the Netherlands. He was the ninth child born to Harmen Gerritszoon van Rijn and Neeltgen Willemsdochter van Zuytbrouck. He is generally considered one of the greatest painters and printmakers in European art history and the most important in Dutch history.